After using pine nuts for the pine nut and almond tart I made last week, I used the leftover nuts to make stuffed squid. I had never had stuffed squid and am glad to have discovered a new way to enjoy it. I am used to using squid in various summer salads as well as in pasta dishes but this was a great way to enjoy it as an appetizer or a light meal. I made a pine nut, tomato and herb stuffing but you could really use anything you think would pair well with squid. The squid sort of looks like mini rockets ready to launch.. but I can assure you that it was delicious! Gently wash the squid and thoroughly dry. Lightly score both sides. Reserve. Seed the tomatoes and cut in small cubes. Finely chop the pine nuts, capers and parsley. Put the tomatoes, pine nuts, capers and parsley in a bowl. Add the lemon juice and olive oil and season with salt and pepper. Mix. Stuff the squid with the tomato mixture. Turn your grill to medium high heat. Lightly season the outside of the squid with and place on the hot grill. Grill for 3 minutes on each side, lightly pressing down on the squid to get nice grilled marks. Serve atop of crusty bread and garnish with parsley. Enjoy! Gotta dig a gal that knows her way around squid...love the dish. I went to Italy when I was 18, with a bunch of other teenagers, when we ordered "calamari" they brought us each a GIANT squid that was stuffed! To teenagers that is a scary thing, but now that I am grown up this looks delicious!! This looks so beautiful that I'm tempted to try squid at home. Very nice recipe and presentation. You know, I love squid, but I've never had it stuffed with anything. I'm definitely going to have to try this...especially because I love pinenuts so much! What a great meal you've put together! That is the best looking squid I've ever seen! Fabulous idea!! I love to stuff squid and grill it! I love your stuffing, though - would love to try it. 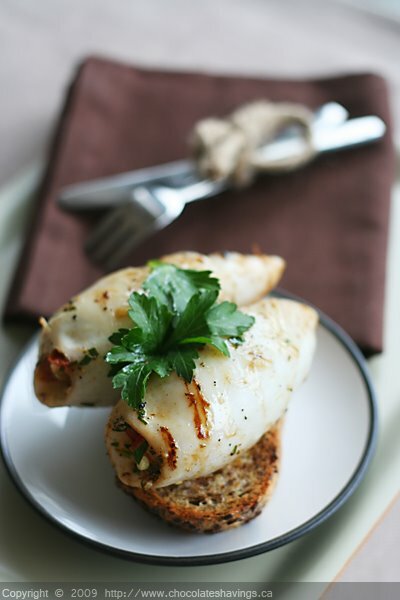 Stuffed Squid is such a terrific Italian light meal! Yours look great and I'll be trying your combo of pine nuts and tomatoes soon! Thanks for charing this great recipe! I am so glad you found this way and shared it because I'm always looking for an alternative to frying. Thanks for sharing this. It looks delicious. I love an excellent squid recipe: superb! !